Flowers from Gilmore's Flower Shop are a true delight to give, and receive! From fun birthday flowers to captivating arrangements of anniversary flowers, or sending good tidings and get well flowers, we have the perfect gift. In need of a gift for a holiday or special occasion? 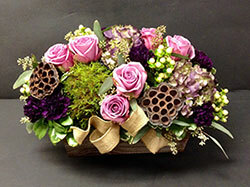 Our holiday flowers and gifts for special moments from Mother's Day flowers to Christmas are guaranteed to please. For those moments where words cannot convey your concern and care, our sympathy flowers and funeral flowers are the perfect thoughtful gesture. For your wedding day or special event, flowers from Gilmore's Flower Shop will make the day extraordinary! With our top-quality service since 1936, you can count on Gilmore's Flower Shop for great gifts and fresh flowers delivered in East Providence, RI and the surrounding areas. 100% Satisfaction Guaranteed!